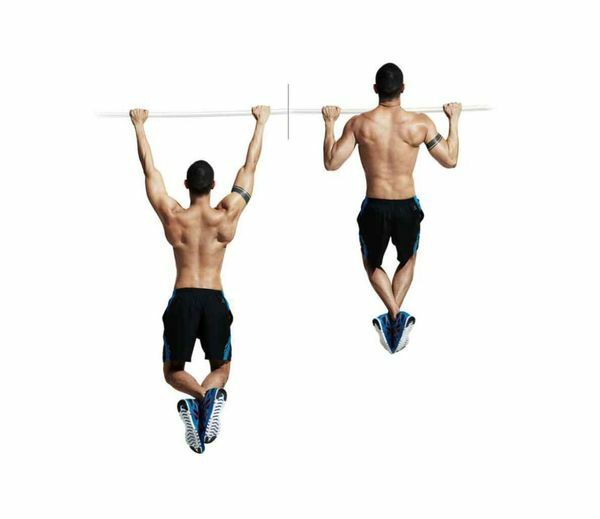 Pull-ups are quickly becoming one of the most popular exercises for back/arm strength training. Everyone who does them knows personally just how hard they are to do, but what if I told you all of your hard work isn’t paying off as much as it could be? If I said all of those hours upon hours in the local gym, all of the blood (hopefully not), sweat and tears are for nothing? This could be you wasting your time due to a few simple mistakes! There are several mistakes commonly made that can hinder your progress and results. Let’s take a look at some of the more serious things people mess up on. The majority of all mistakes stem from having the wrong form. This is vital in milking your routine for all it’s worth and for decreasing chances of injuries. Here are some common problems. Many fitness trainers encourage newbies to keep a straight form. This is ultimately setting them up for failure by teaching the wrong form. Obviously, pull-ups focus hard on the shoulders. In order to flex your shoulders, you have to arch your back, making you very un-straight in the process. Try pushing your ribs towards the bar next time, while locking your shoulders, it’s the correct way and easiest way to ensure you’re doing it right without a spotter.In contrast people also tend to hunch up as they are finishing a rep, this is a no-no too. It takes pressure off of your back, but is wrong. To correct this, simply pull downwards on your blades instead of upwards with your arms. Your shoulder blades should be tensed before you do a rep, this will ensure you are not putting weight on your biceps than need be. A pull-up is all about control and controlling your blades is a great place to start. If you do not have control of your body with this exercise, you are likely going to hurt yourself. To work your muscles to a full extent you need a full range of motion. If you’re only doing a partial pull-up, then you really aren’t working your back at all, only your arms. This will greatly hinder your results and the ease at which you build your strength. Be sure you’re going all the way up and all the way back down. Remember, quality over quantity and form is everything. Slack in those areas and you will hurt yourself and your results, if you don’t do it right you are wasting your own time. Crossfitters do swinging pull-ups in order to do them more quickly, but this isn’t ideal form. Swinging takes a lot of work off of your arms and back, preventing you from having as much of an effective workout. Plus, doing any exercise too quickly or with a huge range of motion like this greatly increases your chance of an injury. Just an important as practicing the correct way to do a move is the equipment you’re using. Does it allow for variety? Is it stable? If you’re more of a homebody and tend to skip out on the gym more than you would like to admit, you should consider getting a gym quality bar for your own home. They really aren’t that expensive and are fairly simple to install. There is a huge variety of products to choose from and plenty of guides to point you in the right direction and help you make a decision on the best exercise bar for you. If thousands of other people trust and invest in a product, then maybe you should too. This makes a statement about the reliability and quality of it. One popular rod is named the Ultimate Body Press Wall Mounted Pull-up bar. With impressive ratings, reviews and price it is widely known as one of the best.This is recommended for anyone serious about getting fit. There are a big variety of grip positions and exercises you can utilize it for. It is also the sturdiest item around, gym quality at a great price.Now, there is nothing to wait for, get started! You have the necessary tools and knowledge to preform perfectly, whether you are at home, in a gym or utilizing your local park use the same tips. Never forget to prioritize quality, it’s good to push yourself, but never to a point that make you sacrifice your form! Drill yourself until the correct method to do it is ingrained in your muscle memory. You can be your own instructor. I wish good luck on each individual’s journey to physical fitness and strength.